Old Marine Hospital's Vineyard Haven location has been prime spot for thousands of years. The grounds of the old Marine Hospital in Vineyard Haven will one day be home to the Martha’s Vineyard Museum and its collections about Vineyard history. But first the history of the land surrounding the old hospital had to be unearthed. And while nothing was discovered that will disrupt the museum’s plans, archaeologists did find traces of human use dating back thousands of years. From April 18 through April 22 archaeologists from the Public Archaeology Lab were on the site excavating and analyzing land that will be disturbed as the museum moves forward with plans to renovate and then relocate to the old Marine Hospital, which was built in 1895 and treated sailors and soldiers through World War II. The property later housed a summer camp; the museum bought the property in 2011. 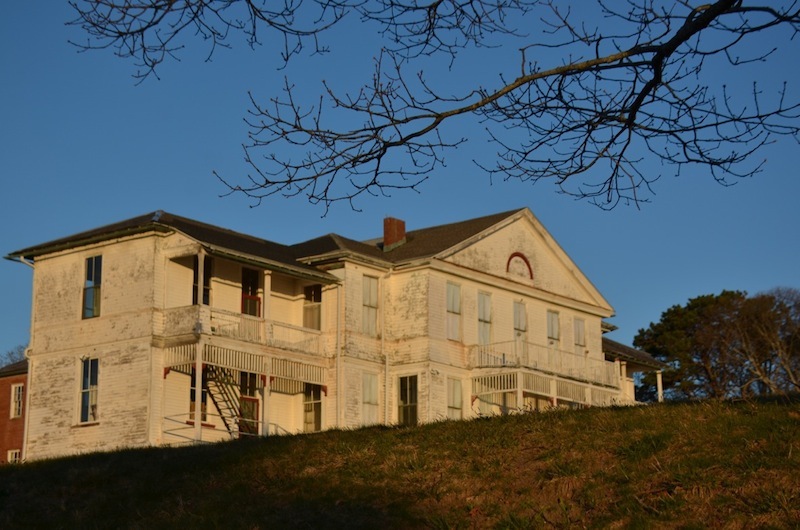 The old hospital sits on four acres on a knoll overlooking the Lagoon Pond and Vineyard Haven harbor beyond. Before any work is done on the site, museum curator Bonnie Stacy said, it was important to find out if any important archaeological materials would be disturbed. PAL senior archaeologist Holly Herbster said this was the second round of archaeological work done at the museum site. An initial survey was done a few years ago, prior to clear construction plans. With orange markers indicating proposed construction areas, archaeologists excavated 50 centimeter by 50 centimeter pieces of land at measured intervals. 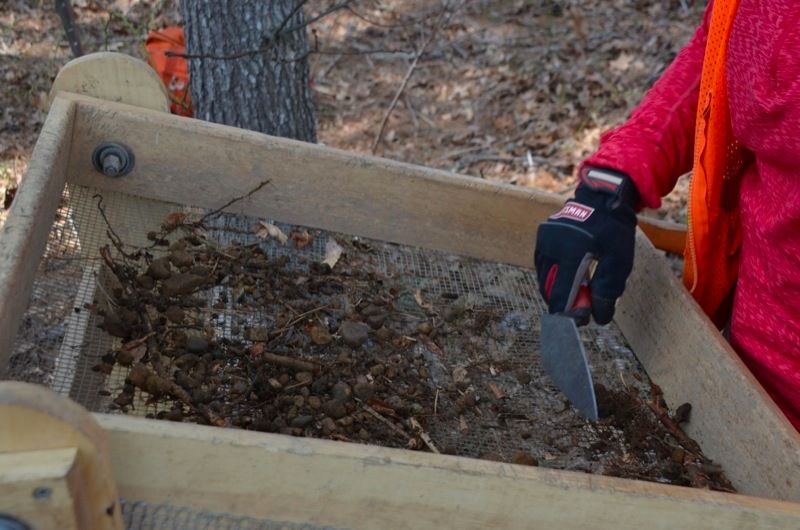 Shovelfuls of soil were sifted through archaeological screens —wooden frames with quarter-inch hardware cloth inside —which left any artifacts at the top of the screen. “This is typically the way we collect material,” Ms. Herbster said. 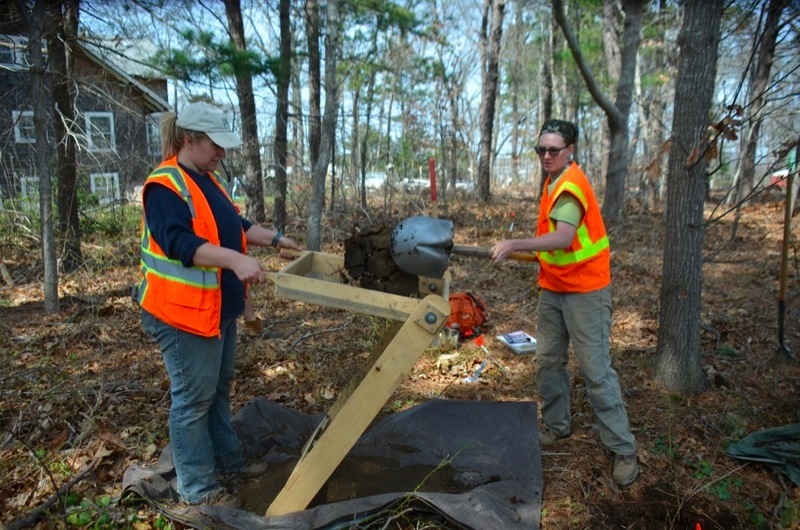 The major finding, she said, was a long history of use by Native Americans at the site. The land was “probably a camp site used on and off over possibly several thousands of years,” she said. The evidence included stone tools, most of them broken; pieces of chipped stone left behind from making stone tools; evidence of food, including shells and animal bone fragments; and burned rock fragments, indicating fire pits. “Obviously people were camping there and preparing foods and eating them,” Ms. Herbster said. 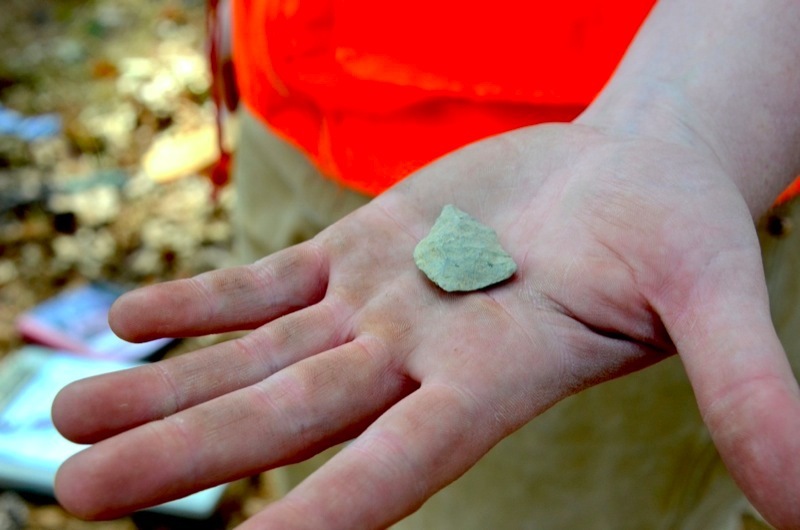 Archaeologists also found a graver, a stone tool with sharp edge or knob that was used by Native Americans to cut or punch holes in leather or other materials. The discovery will not affect building plans. Archaeologists determined proposed areas are safe for construction, Ms. Herbster said, and land that is most likely to have artifacts will be left intact and preserved. PAL is in the process of cleaning and cataloging the found artifacts and taking photos, Ms. Herbster said. When that is done there will likely be a public presentation on the Vineyard to provide more information, she said. Ms Stacy said eventually some of the materials will be used in exhibitions in the museum. More pictures from the archaeological dig. This will always be St. Pierre camp to many of us who went as kids and worked as camp counselors. The memories are priceless. My two sons attending St. Pierre Camp when they were younger. I remember seeing the old cots inside the "hospital" and thought it an interesting history back then. This story helped me remember the memories of one of many good summers on MV. The person to talk to about that area would be Jim Tuck who did a lot of historical digs in area and up the street. During WW 11 my dad spent some time at the hospital after an accident at the airport, which was a naval station.Once it closed it was deserted. Growing up on Skiff Ave., my friends and I use to go there and sneak inside or play around the outside. Lots of fond memories . Wednesday was official moving day at the U. S.